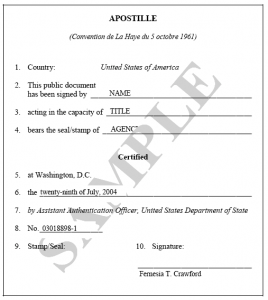 An apostille is required on US issued documents to be recognized in Bermuda, according to the Apostille Section of the Hague Convention, since both the United States and Bermuda are members.The apostille has to be done in the corresponding US government agency in the US state where that document was issued. There is a wide range of US documents that can be apostilled to be used in Bermuda, from Birth Certificates, Marriage Certificates, Divorce Certificates or Decrees, Death Certificates, High School Diplomas, University Degrees, transcripts, medical certificates, background checks, police records, Powers of Attorney to Corporate documents and other legal documents. Find the apostille service you need to marry in a paradisiac Mexican beach! Una vez que tengo la apostilla, ¿necesito traducción por medio de Perito Mexicano para la doble ciudadania?